The Globalization and Localization Association (GALA) is the world’s leading trade association for the language industry with hundreds of member companies in more than 50 countries. As a non-profit organization, GALA provides resources, education, advocacy, and research for thousands of global companies. GALA’s mission is to support its members and the language industry by creating communities, championing standards, sharing knowledge, and advancing technology. For more information visit www.gala-global.org or follow GALA @GALA_global. 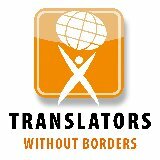 translations and professional, vetted translators who volunteer their time to help.